Pawan was rushed to the ICU two days back – in a critical condition. He has a disease that has completely destroyed his liver and his body is now shutting down. He needs breathing support and an urgent, immediate liver transplant. His father Sriram is a daily-wage agricultural worker who has been struggling to get his son treated for the last two months and is already under heavy debt. Pawan used to be a picture of a happy child. Living in Kothlapur village, Telangana, he enjoyed school as much as he loved playing at home with his toys. His family was amused, exasperated and annoyed in turns with his antics. 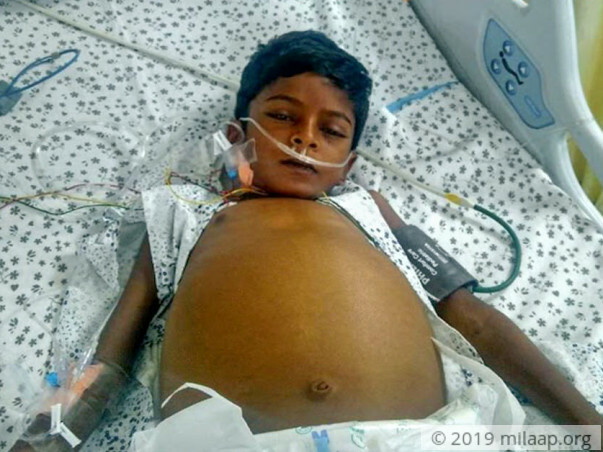 Pawan’s condition deteriorated so fast that his parents still find it hard to process what happened to their active boy. “Pawan is a very active boy. We would often get fed-up with his constant games. In fact, even till a few days back he seemed like the same child. For the last few days he has been so sick and his skin has turned yellow. He is unrecognisable,” Sriram says. Sriram has been running from pillar to post trying to save his son ever for the last two months. When Pawan came home with a stomach pain, Sriram could never imagine that his son’s sickness would get worse and become life threatening. Unable to take Pawan to a hospital with enough diagnostic facilities, Pawan’s stomach illness was not correctly diagnosed till too late. Pawan is now in the ICU – struggling to breathe. He has Wilson’s disease where the body is unable to get rid of excess copper which is then stored in organs like liver. His liver is completely decomposed and his condition is bad. The only an immediate liver transplant can save him now. 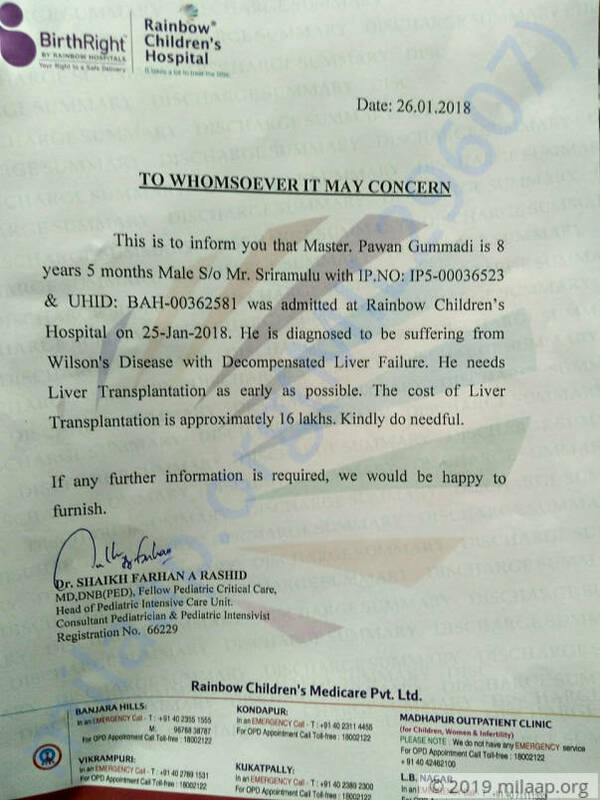 His mother is a compatible donor and is willing to give him a part of her own liver for Pawan. Pawan’s father is a daily-wage farmer in a small village. For Pawan’s treatment, he has fallen into a trap that spells doom for most farmers. He has borrowed Rs 2 lakhs on compound interest for treatment. It is the maximum credit he could get, but it was not enough. “When the doctors told us we need at least 16 lakhs for the transplant I suddenly had a heavy weight on my chest. Getting two lakhs was hard and we have no one to ask for any more money. My wife says we should be ready to fall on people’s feet and beg for help, but I just don’t see how we can arrange the amount in time,” says a helpless Sriram. Pawan’s father has seasonal employment due to the nature of his work. He only works when a land-owning farmer needs help with planting, harvesting or transport. Nothing in his life prepared him for an emergency like this. 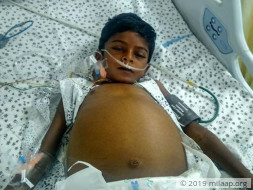 The family really needs help saving Pawan. Sriram and Pawan’s mother Sumalatha have exhausted all their means trying to save Pawan. The last few months have plunged them in a situation that they are unable to cope with. They sold everything they had, left their village and came to the hospital in Hyderabad to save their son. But even that may not be enough. Contribute to help these parents save their son. We have some unfortunate news to share. We received information that Pawan passed away. Our hearts go out to the brave one who fought the deadly disease. Having fought for his life in the hospital for more than 2 weeks, he unfortunately could not make it. His mother was willing to donate a part of the liver too. Her donor work up tests were being done. However he was not very stable and had some internal bleeding. Pawan's family cannot thank you enough for the support and blessings each of you showered. May his soul rest in peace and his parents find solace at this difficult time. The funds raised will be used to settle the hospital expenses so far. We thank you for your generous contributions and prayers. Please keep his family in your prayers.